Today I got a very interesting request from the client I’ve been working with. They loved the new features of PowerView, and wanted to embed the image of their powerview report on the home page of their BI Center site. My first reaction was, this is SharePoint 2010 and PowerView came out in 2012, so no way, ain’t gonna happen. But then I thought about a few more minutes and thought, why not? 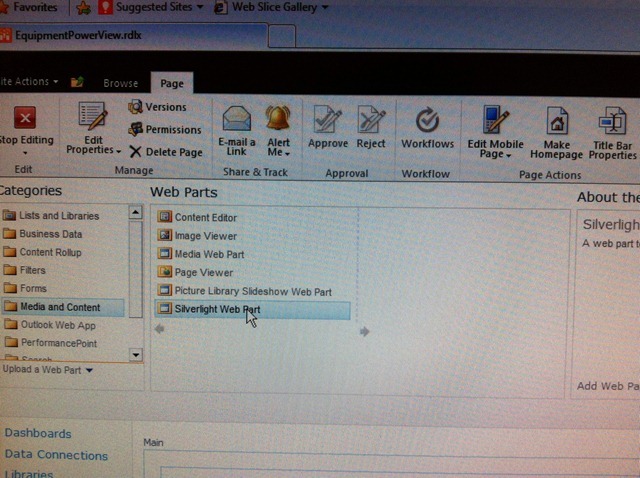 All PowerView really is to SharePoint is a Silverlight plug in, so it should be doable, right? On your site homepage (or wherever you want to create the web part, click on the page tab and then click edit. If there is no browse or page tab, click on the Site Actions dropdown and select “Show Ribbon” to make it appear. After you do that, you’ll get a pop up asking you to enter the Silverlight web part URL. To find that URL, you’ll need to open up another browser tab, go to your PowerPivot gallery, and open the PowerView report. Once it opens, click on Edit Report, and once it loads, go up to (in IE, Page –> View Source). Look for a larger paragraph towards the bottom, and find the tag that starts with param name = “source”) Right after that it will say Value = “something”, where the something in quotes will end with a .Bootstrapper.xap? with a guid at the end of it. 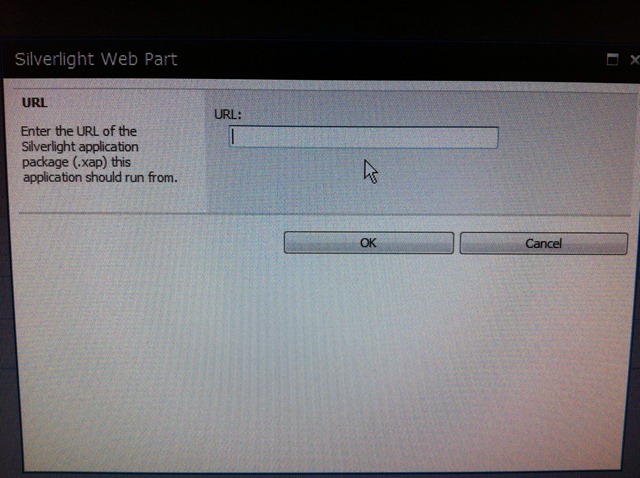 Put your Sharepoint browser connection string in front of it, and then copy it into your web part URL you still have open on your other tab. So your final connection string will look something like: http://MySharePointBIPortal/_layouts/ReportServer/My.Bootstrapper.XAP file. 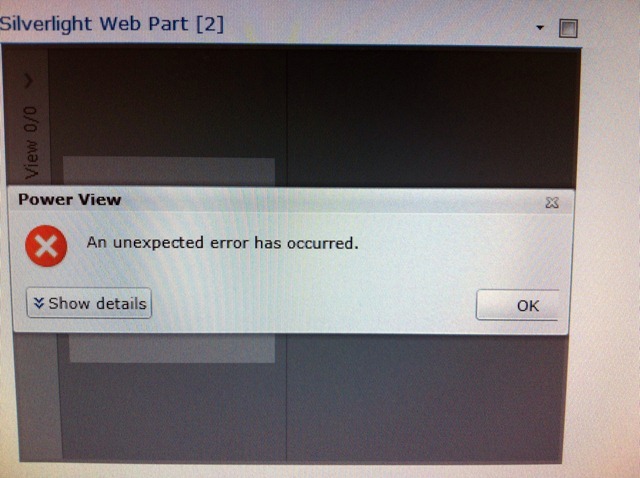 After you’ve pasted it in you’ll get an error message that says “An Unexpected error has occurred.” That’s expected, so don’t worry about it for right now. Click on the dropdown and select “Edit Web Part” and a properties window will show up. 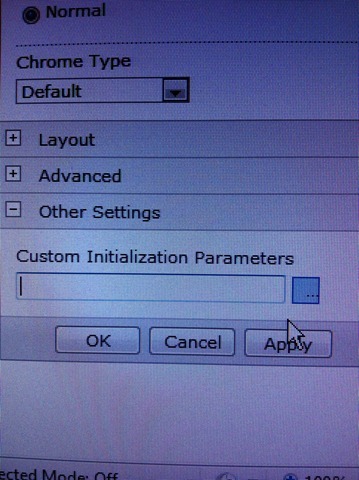 At the bottom there is a + button with Other Settings on it, but all that’s there is a blank text box with an ellipses. Click the ellipses and then go back to your “view source” window that you have up from earlier. This time, look for the tag that says something like Init Parameters or Initialize Parameters and copy the entire piece out the value section. It will end after it says something like ReportSection=ReportSection. Paste that into the the text editor, making sure to replace the special characters with the correct colons and whatnot. I found it easier to just copy the URL for the Sharepoint site and kind of massage it a little. After you’re done with that, click Apply and Voila! You have an incredibly awesome Power View report embedded as a SharePoint web part for your page. If it doesn’t work right away check the ItemPath and ReportServerURI settings, they’re usually the big culprits of it. 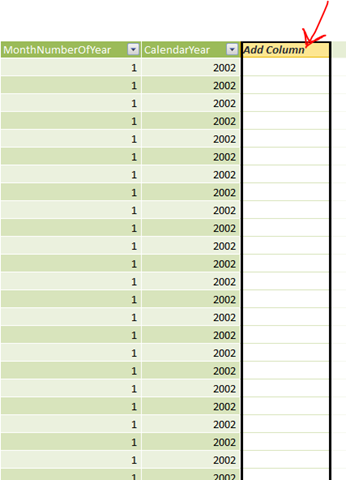 I was recently helping a client set up their PowerPivot workbook for the first time and when they brought the months over on the pivot table, the results of the month weren’t sorted, so for example, April and August were the first months the list. Typically, users want to see months in sequential order (January, February, etc.). As DAX doesn’t have a key order by field, it’s a little bit different than in SSAS, where you can just order by the different key field. 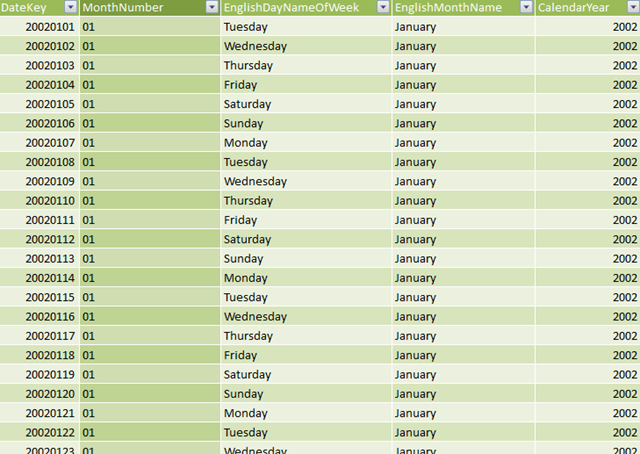 The solution is to create a separate column which is a concatenation of your Month number and month name fields so PowerPivot will display it in order. In the column, type up your formula. Concatenate the month number and the month number with a formula. In between the quotations, you can set it to be whatever you, or your business users, would like to see. Right click and click rename, give your column a name, and go back to Excel. Drag over your new column in your PivotTable, and Voila! 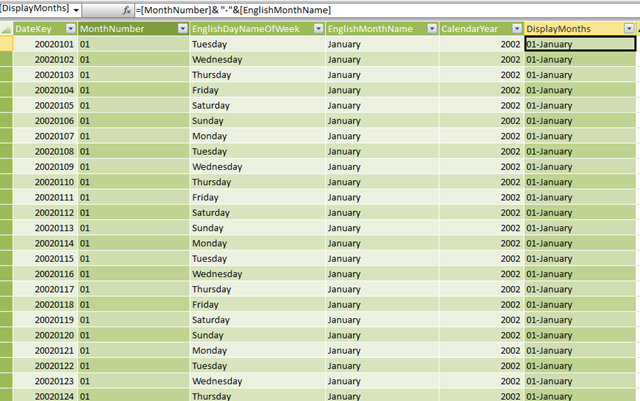 Months ordered in PowerPivot. Using views improves flexibility by providing a buffer between the physical database and downstream systems, like user access and cube population. It used to be that you would build your data warehouse, build your SSAS cube on top of it, and build your SSRS reports off of either a) your SSAS cubes, b) your data warehouse, or c) both. However, with the recent advent of Power Pivot, Power View, and the BISM tabular model, times are changing. Before if you ignored this practice, it wasn’t that bad, because more likely than not, it was just a field in a DSV in Analysis Services you had to change. But now, with all of the additions to the family, that is A LOT more stuff you have to update if you ignore it. Nowadays, ignoring and physically tying to the table creates dependencies on an almost infinite amount of systems, which could have you transforming from a BI developer into a DBA to watch all of those tables and make sure they perform. Views are a tool in the BI developers arsenal to give systems, and business users, insight into what’s going on while still keeping the structure in relative obscurity. The other item I really like about is the “significant physical changes” piece. I’ve seen time and time again where business try to create something themselves, it doesn’t work, so they call someone, but their are already reports and cubes in production that reference the data warehouse. So it’s not an option to just “blow it away” and start over again. Views give us that functionality to support existing processes while we rebuild the inside. What are the different ways business users will want to look at it? Long month names, short month names, weekdays, weekends, holidays, etc. ? How can I structure my table so it’s efficient for all of my BI applications to look at it? Can this actually be easy to maintain if I have to build a humongous date table to answer all of the questions above? Let’s start with Question 1. To really get an answer for this question, the best person to ask is the person who writes the reports. What do they typically see from the business? Who asks for what? Question 2 is a bit longer than the answer to Question 1. The answer is yes, we can. By building all of our columns into our table, we can make it extremely easy and efficient for us to report off of them from SQL, Analysis Services, SSRS, and SharePoint. SSRS and SharePoint wind up deriving off of Analysis Services, so that’s a little bit of duplication there. 🙂 But we COULD go back straight to the date dimension if we wanted to. And question 3 is yes again. The trick is to just build up your shortcuts up front to make Analysis Services, etc. quick when they process, but to do it in the table directly up front and not want and do some funky concatenation in AS. The proc at the end that gets created sets the current day flag equal to today’s date. If you put that in a job and execute at midnight every night, your current day flag will update every day. In the proc Generate Date, it’s set to check and make sure that the default member exists while it’s running. That way if it’s missed when the table is initially built, or is truncated for some reason, it will always be added. I generally use a default date dimension member as 19000101 (01/01/1900), but if you use something else feel free to modify it. The function came from Tim Cullen over at MSSQLTips (http://www.mssqltips.com/sqlservertip/1537/tsql-function-to-determine-holidays-in-sql-server/) to calculate Easter. Thank you Tim, you have no idea how much time/frustration you saved me. The Set Holidays proc is wrapped so it’s run as a part of the Generate Date dimension, so as new dates are added the holiday’s are automatically populated. XML configuration files can be incredibly powerful and your worst enemy at the same time. We can use XML configuration files to configure multiple properties from file that exists on the server, or we can use it as a master config file to point the rest of our configuration options in our packages to a SQL table to resolve the rest of our connections. To access Package Configurations in BIDS 2008, go to the menu bar at the top of the page and select “package configurations” from the list. Select “XML Configuration file” from the dropdown and then select the Browse button that is active. Select a location and give your folder a name. Check the box next to the property you wish to change. Click next again, give it a name that makes sense so you can reference it. As a standard, I usually give it the same name as the connection (or whatever it is) that I’m configuring. Then it’s easy to reference if you want it again later. Now we just need to add it into our view. Quick alter statement to query extended properties and join it to our other system DMV data points, and whoa-la! The semi-annoying part is we insert our extended properties in a normalized fashion, denormalize them to insert them, and then renormalize them on the other side. However a quick CTE with a pivot statements pivots our properties back out into columns. Sorry for the long post as well. The data we need to access exists on the object level, so we need to look at the objects, types, and indexes section of the system views. Specifically, we’re looking for data around columns, which lives in sys.columns. We’ll also need sys.schemas, sys.tables and sys.systypes. sys.columns and sys.tables join through an equijoin on object_id and sys.columns and sys.systypes join on a non-equijoin between system_type_id and xtype. Putting this together quickly we can generate a simple quick query which gives us all of the columns and tables and what schema they’re in. Now we have a really nice query that tells us every column, what table they’re in, what schema, and then whether it’s nullable, the data type, precision, scale, and if it’s an identity column. In part 2 I’ll post leveraging this query to use extended properties and then eventually, creating an SSRS report to provide out.